Lucien B. Martin along with his son, L. Phillip Martin, founded The Lancaster Glass Company of Lancaster, Ohio in July of 1908. Production of glassware began late in 1908. Early production consisted of crystal pressed tableware, vases and novelties. The company was also an early innovator of color. According to the Crockery and Glass Journal, in 1922, colored glassware was available in Gold, Gray, Coraline, Citron, Turquoise, Taupe, Maroon, Iris, Blue, Topaz and Delft. Lancaster Glass became a subsidiary of the Hocking Glass Company in 1924. 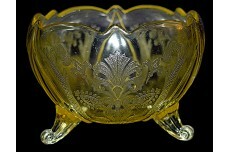 The company made many Depression Glass pieces including tableware and kitchen items. During the Depression Hocking supplied The Lancaster Glass Company and The Standard Glass Company (also a subsidiary of Hocking) with many blanks which both companies etched with their own patterns. Two of Lancaster's most sought after patterns are Patrick and Jubilee. By 1937, Lancaster was fully incorporated into Hocking Glass and the Lancaster name was no longer used.